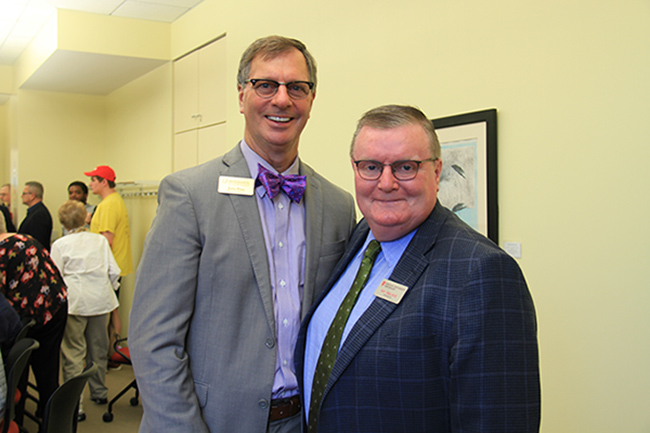 Chancellor Ray Wallace with Executive Director of the Horseshoe Foundation, Jerry Finn, at the student newspaper digital archive celebration. Alumni of IU Southeast’s journalism program, past student newspaper writers and advisors, came together Tuesday to celebrate the official launch of the student newspaper digital archive, a website that will display 60 years of IU Southeast student publications. The crowd browsed through past issues online and reminisced on earlier editions of the newspaper. The archive features editions dating all the way back to the very first volume published in 1947 to the sixty-first volume published in 2006. The digitization and indexing of the newspapers were made possible by grants from the Horseshoe Foundation of Floyd County and Indiana University Bicentennial. During the celebration, several guest speakers including previous student newspaper advisors Jim St. Clair and Ron Allman highlighted interesting editions from the years and reflected on their experiences. The public can now view the continuous improvement of the issues over the years, from the early editions, which were only one to two pages, to more recent and updated versions, on the LibGuides at IU Southeast website.